A removable denture is a way to replace many missing teeth. There can be full or partial removable dentures. A full denture replaces all the teeth on both or either the upper or lower jaws. A partial removable denture replaces a smaller number of teeth using the existing teeth as anchors. Full dentures are typically made out of acrylic or a flexible plastic material. Partial dentures require a metal framework to allow for the clasping to hold onto the existing teeth. These clasps are generally made in metal and are part of the framework. Clasp free partial dentures are possible when combined with crowns to allow the denture to “anchor” to the teeth with the crowns on them. These clasp free designs are possible with the use of “precision attachments” between the anchor crowns and the dentures. 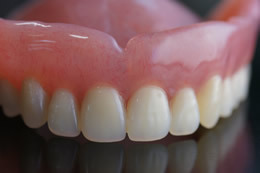 The most comfortable removable dentures are those that are supported by implants. The dental implants allow the denture to “anchor” to them. This is also done with any clasps. The denture looks is able to remain in place without any adhesive or worry that it will “fall” out. This gives the denture a most pleasing and natural look.